It seems downright irresponsible not to have a blog post on Mt. Livermore… so here it is! At an elevation of 788 feet, Mt. 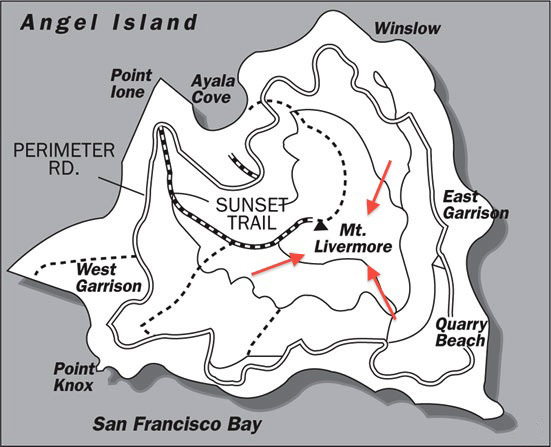 Livermore is the highest point on Angel Island. Hiking to the peak via the Sunset Trail or North Ridge Trail is a bit of an undertaking but the VIEWS — sometimes reaching as far as Napa and Sonoma to the east, and San Jose to the south — make it well worth it for those who are up for the climb. Once called Mount Ida, Mt. Livermore is officially named Mount Caroline Livermore, in dedication to the conservationist who championed the creation of Angel Island State Park. The peak itself has also undergone a number of physical changes over the years. During the Cold War, the top portion was flattened to accommodate a Nike Missile site, then reconstructed after the island was demilitarized in 1962. 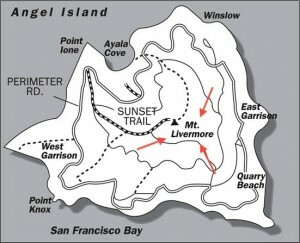 A popular way to reach the summit is the Sunset Trail. After getting off the ferry, follow the paved road uphill past the Visitor Center to where it intersects with the Perimeter Road. The trailhead is clearly visible at beginning of the intersection. There are picnic tables at the top allowing you to rest or enjoy a meal while you take it all in. Many people like to take the North Ridge Trail on the way down, as it provides additional landscapes and excellent views of the Bay. Should you choose this route, simply take a right when the trail rejoins the Perimeter Road and continue until you reach the road down to Ayala Cove.